Carrot soup with ginger and coriander is an easy low-fat vegetarian and vegan soup recipe that you can serve for a light lunch or dinner. Coriander seeds have a lovely aroma, particularly when heated for a few minutes in a skillet and add a distinct flavor to a basic carrot and ginger soup, taking it from ordinary to extraordinary. If you have powdered coriander, that's fine to use instead as well. Inspired by the flavors of India, this carrot ginger soup is made with little more than onions, carrots, fresh ginger, coriander seeds, and vegetable broth. This could be served with some crusty French bread or perhaps some Indian naan bread and a side green salad to make it into a full and hearty vegetarian meal. This recipe is both vegetarian and vegan (as long as you use a cooking oil and a dairy-free and vegan margarine), and, if you need it to be gluten-free as well, just make sure to use a gluten-free vegetable broth. In a large soup or stock pot, cook the chopped onions in the margarine or cooking oil just until soft, about 3 to 5 minutes. Add in the diced carrots, fresh ginger, and the coriander seeds and allow to cook, stirring frequently, for a few more minutes. Next, add the vegetable broth and bring to a low simmer. Cover the pot with a lid and allow to cook for at least 25 minutes, or until the carrots are very soft and tender. Carefully transfer the soup to a blender or a food processor and puree until smooth or almost smooth, depending on how you like your soup, and working in batches if needed. Add a dash of salt and pepper (sea salt or kosher salt and fresh ground black pepper is always best) and serve your soup hot, reheating if necessary. 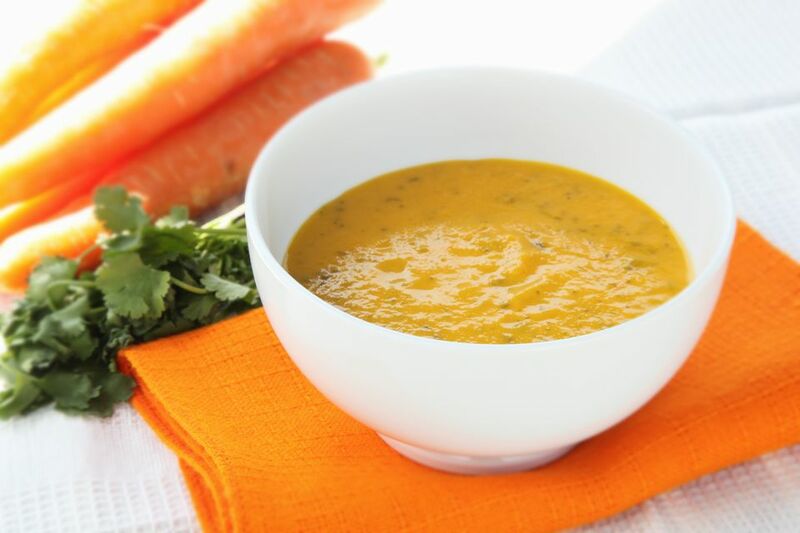 Enjoy your easy homemade carrot, coriander and ginger soup!